It 3 AM in the night, woken up by sound of drops of rain falling...It's first rain of the winter @ Gurgaon. 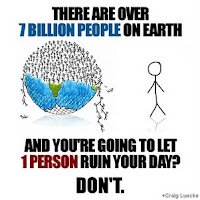 "There are over 7 Billion People on Earth and you'are gonna let 1 Person ruin your day ? DON'T"